The Ten-Tec Model 418 100 Watt Amplifier on display at the 2011 Ten-Tec Hamfest. Click to enlarge. Today at the 2011 Ten-Tec Hamfest, Ten-Tec announced two new products in development: the Model 539 QRP transceiver and the companion Model 418 100 Watt amplifier. Being a QRPer, I typically have no use for amplifiers, but this one, I must admit, will make for a perfect in-the-field companion to the (future) Model 539 or any QRP transceiver. 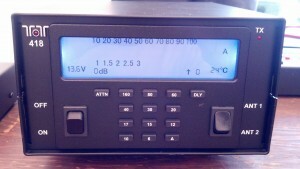 The Model 418 can sense the incoming RF and will automatically switch bands accordingly. Best of all, though, is that the standby current will be as low as 150mA! This entry was posted in Announcements, News, Portable, QRP Radios and tagged Model 418 Photos, Ten-Tec, Ten-Tec Model 418, Ten-Tec Model 418 100 Watt Amplifier, Ten-Tec Model 418 Photos. Bookmark the permalink. So why would a QRP guy want a 100 watt amplifier? Doesn’t that make U a QRO guy then? Life is to short for QRP……………. We in the QRP community have ben waiting a long time for a commercial 100 watt amplifier to become available for use with our “5 watters”. Accolades to Ten-Tec for hearing our voices. I for one, can’t wait to acquire the new 418 amplifier. While the unit seems a bit pricy at 600+ dollars, I for one, will definitely look forward to its availability. Yes–actually a solid price of: $785. They started taking orders at Dayton and shipping at the end of June. Ron–I completely agree with you, OB! Eight hundred bucks will buy you a good used, multimode HF rig with a CW filter, built in keyer, antenna, 100 Watts out, and a six-pack of Guiness. I have a FLEX-1500 but I bought the “HLA-150 Plus” amp. It’s not high quality and if you are not a good ham, you will wipe out the band with splatter. By “good ham” I mean someone who know how to not overdrive this monster 😉 I don;t go over 90-100W although it can crank out 150W… with tons of junk. I make sure my MIC LEVEL doesn’t go over the 100% and the amp works just fine. The TenTec amp is in a different category. It’s designed for hams and passed FCC certs. The HLA-150 Plus is an Italian amp designed for… “out-banders” (LOL) and very little has been made to prevent it from splattering everywhere.